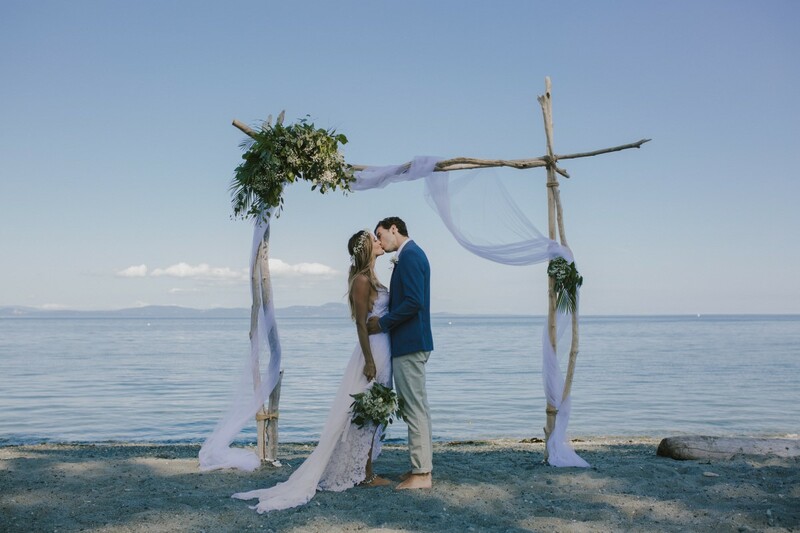 Sun kissed bridal beach session stars real couple Caterina + Trevor amid all the beauty of Vancouver Island weddings. The driftwood strewn beach and sun dappled trees showcase our romantic and trendy couple! THE STORY of this editorial is the lush green colours and the ocean blue beachscape. Eco chic at it’s finest! The grandeur of the landscape complements the intimacy of the couple. Plus a cascading bouquet filled with greenery. We love the tiny floral in the bride’s up do BRAID – what an amazing look! This gorgeous Lis Simon GOWN features lace bodice, open back and light as air skirt! We love that the groom received such STYLISH attention! The patterned bow tie, over sized buttons and navy beach apparel are wonderful!